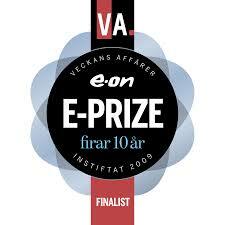 E-PRIZE is Sweden’s largest “clean-tech price” for the business sector, founded by Veckans affärer and E.ON. and celebrating it’s 10th anniversary this year. Mindconnect is one of the three finalists within the “sustainable transport” category, among the most promising clean tech innovations in Sweden right now. The winner will be awarded at the Go Greentech conference in Stockholm on 11 October.